Panettone is made with a natural yeast starter that is fed frequently and maintained at a warm temperature to render it less acidic than a typical sourdough starter. I start with my regular, 100%-hydration starter and convert it to a 50%-hydration (stiff) starter over a few feedings. Then I continue to feed it every four hours, for a minimum of 12 hours and up to several days. A proofer, a new addition to my kitchen this year, is fantastic for keeping the starter at the recommended temperature of 85F. If you don’t have one, a plastic box or bag with a frequently-replenished bowl of hot water can work. You don’t have to schedule middle-of-the-night feedings, 4-hour timetable notwithstanding. Just give it a larger feeding and turn the temperature down to 80F or so before putting it to bed for an 8-hour night. Detailed instructions for preparing the starter are below. Osmotolerant yeast (SAF Gold) is often used in sweet breads. Sugar, which in appreciable amounts interferes with yeast fermentation, does not bother osmotolerant yeast as much. However, if you can’t get it, you can use a larger quantity of regular instant yeast. Diastatic malt aids fermentation by breaking down starch in flour into the kind of simple sugars that yeast can use. 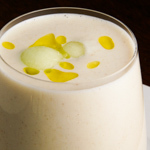 It is particularly useful in long-fermenting doughs like panettone. Candied orange and lemon peel are very easy to make, and homemade peel is less syrupy than what I have found in stores. It freezes well, too. I use the flour I normally use for bread. Use good butter; you will taste it! It must be pliable (but not melted) when it is added to the dough. I achieve this by leaving it at room temperature overnight. You could also soften it, more quickly, in a proofer set at 80F. The microwave is risky. The corn flour used in the glaze is very finely ground corn (finer than corn meal), not to be confused with cornstarch. Glaze is optional, but if you go for it, as I always do, spring for some Swedish pearl sugar (not Belgian! ), which makes a beautiful finishing touch. Blanch whole almonds by pouring boiling water over them and letting them stand for a few minutes until they pop easily out of their skins. Panettone requires a very disciplined mixing technique. If you’re not willing to be patient with the mixing, don’t bother. Butter and sugar require strong gluten to support them. However, those thankless little ingredients also do everything they can to impede the development of that gluten, as does water. Therefore, these three things are mixed into the dough in a specific and controlled way. Initially, the dough is mixed using only a fraction of the water, and none of the sugar and butter. Then the sugar is added slowly, in several increments, and the dough is further mixed until the gluten is fully developed. Only then is the butter incorporated, and only after that is the remaining water added. This takes at least 30 minutes and on occasion has approached an hour. I am not kidding. Really. Seriously. Trying to hurry it along will only backfire and you’ll be mixing for three or four times as long. Don’t ask me how I know this. 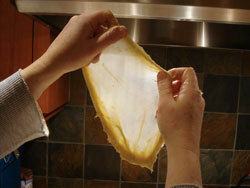 Paper baking molds are traditional and easy to use. They come in a variety of sizes; make sure you use enough dough for the size of the mold, or the loaves will not rise above the edge during the bake to give you that lovely, characteristic mushroom shape. I usually use 500 grams of dough in a 5 1/4-inch-diameter mold; for a 6-inch mold I would use about 700 grams (so the recipe below would make two loaves, not three). 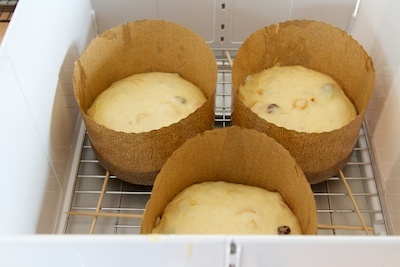 Because panettone needs to be hung upside-down for several hours after baking to ensure that it doesn’t collapse in on itself, I insert bamboo skewers into the paper molds before putting the dough into them. 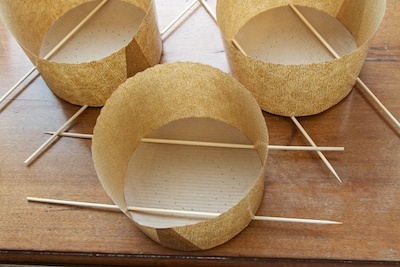 The skewers are left in for baking and provide the “hooks” for hanging. If mixed properly, the dough is very strong but very soft and sticky. Shaping balls and placing them into the molds is challenging. A well-buttered counter and well-buttered hands help. I use a bench scraper in one hand to tuck the edges of a dough ball under as I am rounding it. (This is difficult to explain; I’d like to make a video showing it, but that will have to wait until next year.) Use a swift, light hand when lifting the dough balls into the molds. A proofer is ideal not only for preparing the sweet starter but also for the final proof of the loaves, which is ideally at about 80F. Three 5 1/4-inch loaves fit comfortably in my Brod and Taylor folding proofer. Other options are an oven with the light turned on and a bowl of hot water inside, or a large plastic bag with a bowl of hot water (replenished frequently). You can also proof the loaves at room temperature, but it will take a lot longer. When fully proofed, the top of the dome of dough should be about even with the top of the mold. This means the dough has not reached the top of the mold at the edges, and you shouldn’t let it! Otherwise the glaze will run off the outside and it will be a big mess. Don’t ask me how I know this. Glaze is optional but makes the panettone beautiful, in my opinion. If you opt not to glaze, snip a shallow X in the top just before baking, and tuck a pat of butter inside. The best way to evenly distribute the thick glaze is to pour it over the center of the loaf and use a pastry brush to tease it out over the surface. It will run down and pool at the edges; don’t worry about this. After the glaze goes on, give it a very liberal dusting of powdered sugar. It will melt almost immediately (in my photo below, you can’t see it at all), but that’s ok; it will still do its job of giving a delicate, brittle quality to the top. The final garnishes are Swedish pearl sugar and whole blanched almonds. Apply the pearl sugar rather densely and crowd the almonds in the center. They will spread out as the top of the loaf expands during baking. As mentioned above, the loaves need to be hung upside-down immediately after baking. I discovered this year that a folding laundry drying rack makes an ideal hanging apparatus. (I have actually been patting myself on the head for days over this bit of brilliance.) If you don’t have one, suspend two dowels between chair backs. Occasionally the top of a loaf will want to pull away and fall off while it is upside-down. Don’t ask me how I know this. If you you notice it starting to happen, you can gently place a pillow under the loaf, as I did with my middle one here. Okay. Ready to get started? 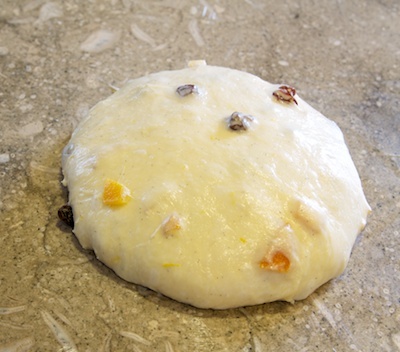 To start mixing the final dough: To the first dough in the mixer bowl, add the flour, salt, egg yolks, orange zest, vanilla seeds, and 40 grams of the water. Mix in low speed until the ingredients are just combined, about 3 minutes. Allow the balls to rest (may be left uncovered) for 20 minutes. Meanwhile, skewer the molds. Proof at 80F for 4 – 6 hours (or about 12 hours at room temperature), until the tops of the dough domes are even with the top of the molds and the sides are an inch or so below the tops. Optional step: To mix the glaze, whisk all ingredients together. Pour, brush, or pipe the glaze evenly onto the top of the loaves. Sift powdered sugar generously over the tops, then sprinkle with pearl sugar and garnish with whole blanched almonds. If you leave the panettone unglazed, use scissors to snip an X into the top of the loaf and tuck a pat of butter inside. Mix 20 grams of stiff starter with 20 grams of flour and 10 grams of water. Ferment at 85F for 4 hours. 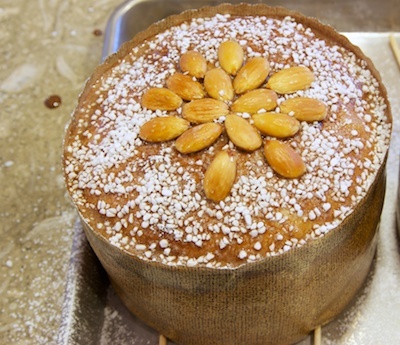 My goodness what a wonderful lesson in how to make Panettone! I’d like to think I’ll give this a try in the coming year. Your guidance in this post will be much appreciated. Thanks! Beautiful! Homemade panettone is incomparable. I’m just feeding my sweet starter now for the second day 🙂 It is so great to have vacation the week before Christmas so I can babysit the starter. 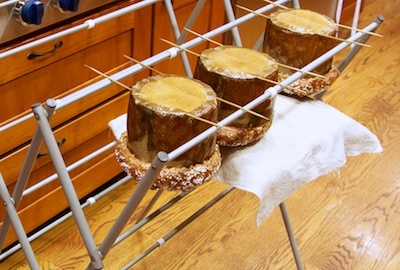 I love your idea to use the drying rack for hanging the panettone upside down. I have to test if this will work with my rack, too! Your panettones are quite awesome. I made some last week-end but they aren’t as beautiful as yours!!!! Panettone is the best. But based on how hard it looks to make, I might stick with my store bought favorites. :), I think I will make it again. Thanks Susan! This Panettone looks the best that I have seen and that includes the Italian language blogs too. I have some lievito madre that I made myself and have kept alive for a couple of months. So, I think that I will give his recipe a go and blog along as I do so. I love your panettone posts! I use your skewer hanging upside down method every time I make it. Thanks so much! always tricky this Panettone, but so delicious!! You made such pretty ones! I won’t be baking it this year, maybe again next year. This time I’ll be making the Pandoro again. Have a wonderful holiday season! Just had to comment! What a stunning post! Your Panettone is just ethereal! I was a little disappointed by my first effort, which I got out of the oven today. Too dense, not flaky enough. I think that the main problem was dough development. I am patient, and have been baking sourdough for years, so know that it doesn’t work if you try to rush it. I usually mix by hand, but used a Kenwood with a dough hook, but even without adding the other 70 or so mL of water, it was too wet and not coming together nicely, after more than an hour of mixing. Anyway, it is edible, and the taste is authentic, just the texture that needs working on. Next time. I made 3 batches of panettone prior to New Year’s using another recipe and managed to get something close on the first try, but subsequent batches were too dense. Now I am trying your recipe. I have succeeded at making a wild yeast starter via your directions and am working on the stiff starter. Even went so far as getting the proofer box…. Almost ready to start. 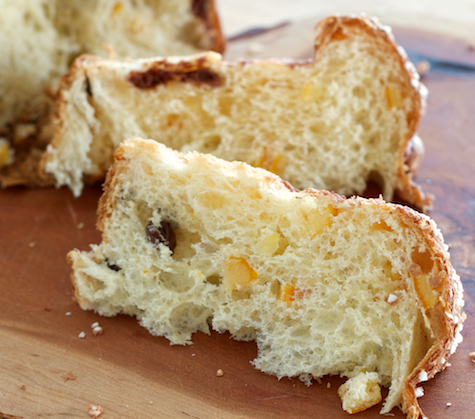 Question: For the proofing of the panettone loaves, do you add moisture to the proofing box’s tray or skip it? I suspect it isn’t really needed – but thought I’d check first. Barbara, yes, I did add water to the tray, although as you say, it may not be necessary. Good luck! Thank you for answering that! One more question: For the “sweet starter” after the nightly feeding, do you maintain the 85° temp in the proofing box? Never mind! Your directions state turn it down to 80°. I made three loaves over Christmas and I must say they came out brilliantly. Lovely rise, perfect texture and taste. Everyone highly impressed. Weirdly though, in two of the three I had big air pockets. One was near the top crust, but one was at the bottom of the loaf. The third panettone came out absolutely perfectly. What do you think that might be down to? Just served freshly baked panettone following your directions faithfully. Turned out fabulously! Light texture – so delicate and delicious! Love your website. Sourdough bagels are next…. This is the most amazing bake I’ve seen ever. I’m utterly taken by this sweet bread for many reasons, taste being one, but mostly, because I faithfully fail whenever attempting it, which makes it so much more desirable. My admiration for your skill is never-ending, Susan. You’re fantastically talented. I have been anxious to give making panettone another chance after my first attempt was a disaster (it was not your recipe). I have had my eye on your recipe and finally decided to give it a shot. First, this is the most delicate, moist, flavorful panettone I have ever had! I am an Italian-American and grew up eating both homemade and store bought panettone…this recipe yields the most incredible panettone I have ever tasted. Bravo to you! My only issue was that the panettone did not give mushroom top. I did add a little more raisins and orange peel (200 grams each). I proofed it overnight at room temperature (72 degrees…11 hours) with a proofing bag. I decided to bake it because it had just reached the top of the mold. I did not glaze it, but did the “x” snip and butter pat method. It fell in the oven. I did hang them to cook for 8 hours. When I cut into them there was a large air whole in the center where it had collapsed. I’m not sure what I did wrong. Any tips??? Should I have let it proof until it was above the mold? I plan on attempting this again next week…my 3 year old and 2 year old loved it! My 3 year old told me it was the best panettone ever! haha! Just reading your article and wondering what your recommendations are for a proofer for a home. Andrea — A hole in the loaf could indicate that it was not fully baked. Or it could be that the gluten was not strong enough to support the weight of the fat and the fruit — either because the loaf was overproofed, or the gluten never fully developed during the mixing process. Also, make sure you use the right size mold for your dough weight. If your mold is too large you may overproof waiting for the dough to reach the top of the mold. 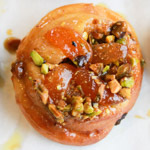 Poim — see above, my notes about the sweet starter. Thank you for your speedy response, Susan! My window pane test showed a high level of gluten development, so maybe I did overproof it. I am using a 6 1/4 in mold, so I will try a 5 inch mold next time. I love the extra fuit in the dough, but if it is going to be at the expensive of a beautiful mushroom top then I will follow your meausrements. Ok…next week will be round 3 🙂 Thank you for your help! Ok my Sept 7 comment is there so here’s a copy of my comment from last week. Fantastic website…thanks so much for sharing. Your panettone looks spectacular but I just don’t have the patience for all that ‘babysitting’. KISS – Keep it Simple Stupid – is my motto! I’m always modifying recipes. Thanks for the tips on using leftover sourdough btw – your banana loaf looks great. So I took info from four different sourdough and commercial yeast recipes and came up with a SIMPLE SOURDOUGH one that bowled me over by producing a perfect panettone … soft, delicate, moist, divine! And I just used my usual 100% hydration starter – and no salt. My friends keep telling me to write a book with all my wild (and healthy) modifications. Maybe I need to patent my recipes – someone told me that just by publishing on the web that equals patenting. Anyone know if that’s correct? Susan? Mille Grazzi! Great website. Thanks for sharing. I made panettone for the first time using this recipe last week. It was wonderful! All three loaves went very quickly so I suggest you double up. Panettone makes a wonderful gift! Only problem I had was finding diastatic malt powder locally. I could have ordered it online but I didn’t want to wait. So I made a quick trip to a local home brew shop which sells supplies for making beer at home. I purchased 1/4 pound of malted barley which I then ground fine using a spice mill. Problem solved! These are genius!! An Italian colleague pointed me to this link and I am so glad she did!! Great instructions and pictures and so detailed! Really enjoyed the whole process from creating the starter to getting a cooling apparatus sorted out from a large cardboard box! The tip about padding the tops whilst cooling came in particularly handy and I am proud to say that my three panettones certainly look the part. Thank you thank you!!!! Can we make this pannetone without the commercial yeast. Why do you need the commercial yeast? I did, and it worked wonderfully. Made this for the first time on Dec. 8, 2013 and based upon the rave reviews of family and friends I decided to enter this bread into the Californial State Fair Bread contest. It got a First Place finish and then took Best in Class! This really is a great recipe. Thanks again. Great recipe! I made two loaves (I had bought slightly bigger molds) and they came out FANTASTIC. As I took the first bite, I was thrown back to my childhood, tasting my grandmother’s panettoni once again. One modification I had to make was the amount of flour. The dough was way too wet with the amount of flour specified, so I had to add more, eyeballing it as I went along. Fortunately, I’m a fairly experienced baker and have made brioche before, so I knew when enough was enough. I think I’ll modify this recipe so that the final dough takes 160g of flour. Still, a great recipe. Thanks for the tip, Gabe! Must be the flour that we were using, but I originally freaked out when I was doing the mixing for the final dough as it was very liquidy. But when i added the extra 80g or so of flour, it really came together really nicely. It was still wet, but the dough hook was then finally able to pick up the dough and knead it. I notice that there’s no milk in the recipe. Is it traditionally without milk? or can I replace some of the water with milk? Will that mess up the rise of the dough? I’m sorry to comment on an old post. But I’ve tried a few panettone recipes, and I’m having trouble reaching the required gluten development. I’ve been mixing/folding by hand — is a stand mixer necessary? Yes. You really should use a good mixer for this as there is a pretty intense level of dough development required. Hi, I am not a professional in baking,I bake just for my family. Now, I am at the point to start exploring the sourdough. I relly want to try this recipe. Can someone tell me where I can find ” diastatic malt powder”, and “stiff sourdough starter”. Thank you! I really want to try this panettone! Diastatic malt powder can be purchased from Amazon. 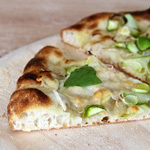 You can google SD starter or buy it from King Arthur Flour. I made all of mine, but KA works very well, from what I hear. It took two attempts (an overproof on the school run first time around) but this is a fantastic recipe. The dough is marvellous and produces a great flavour. I baked with the dough about 2cm below the side of the case and had a great outcome! Thank you! Thanks for this wonderful post. 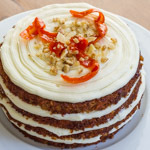 I have used this recipe for my first attempt and experienced suboptimal gluten development after 45 minutes of mixing. I am wondering if the final dough 86 gm flour and 114 gm water (hydration 132%) might be a little too high at least for the KAF I used. The addition of extra flour promptly remedied my weak dough. Thank you so much for that amazing recipe! Easily the BEST Panettone I’ve ever eaten! Excellent recipe. Patience is a virtue and if you wait 24 hrs after baking to eat it the flavours of this panettone will reach the heaven! Thank you for sharing your knowledge and experience! Just stumbled on your site and was hooked. Tried making panettone several times and were all flop. This time am trying your recipe which is very detailed to say the least. The hitch is can the malt powder be left out? What is a stiff starter? Because of those knitting needles, this looks like it was based on the Martha Stewart (Gabriele Riva) recipe. Was it? If so, did you truncate the time it takes to make the dough because it took too long and this way came out with a similar flavor? Thank you so much for this great and thorough tutorial!!! I made the recipe and it came out perfect! Why do you call it sweet start? I don’t see anything sweet added in the mix? The exact same thing happened to me today- first time trying this recipe. Did you ever find out why this happened? Looks great. I was wondering, have you tried making it without the instant yeast, I would like to try your recipe but only want to use the natural starter. I’m thinking just to use more starter than you call for, say 130-150 grams. Thoughts? Quick question is this correct? Under method your first bullet point says: “Mix 20 grams of stiff starter with 20 grams of flour and 20 grams of water. Ferment at 85F for 4 hours” Is this correct? Wouldn’t it be 10 grams of water. Thank you, you’re right! In 5 years, no one caught this error before now. It’s fixed now. Happy holidays and happy baking! Thank you so much for getting back to me! Your Panettone recipe is by far the best english language recipe I have found, it’s so detailed. Where did you learn so much about the lievito madre? My Italian is not great, especially when it comes to technical bread language. Ironically I passed an archaeology exam in Italian. I love your blog, it’s so detailed! I’ve made this recipe for the past 3 years during the holidays I take from work: it is too time consuming to try any other time. It is soooo delicious. Everyone raves about it. It’s exquisitely delicate and fragrant. I have made the candied fruit peel too, following your instructions. One question/problem I have is that the dough is much more moist than yours appears in the picture: it spreads out much more on the bench while yours appears to be firm. Because it is so moist, when I tried the glaze one year, just the weight of the glaze caused it to sink through the top of the panetonne. So something must be off. However it bakes out to be just as light and delicious as I could ever hope, so I guess I must be doing something right. I’m so grateful to you for this blog. Thanks! Hi. I’m from Argentina, so were at the same season, Nerissa! I tried this recipe last week and turned up great (I have tried many recipes before, this was the best by far). Yes, you can just split the recipe in half and maybe adjust the baking time a little (more volume, more time). Molds here are sold by the weight they are supposed to contain: 500 g, 750 g, etc. Oh, I forgot to say. I don’t pay too much attention to the baking time, I just measure the internal temperature. I like 78 Celsius more than the 85 suggested in the recipe. The dough keeps cooking for a while out of the oven before it cools down and the result is a very wet texture, just the way I like it. I insert an oven thermometer in the middle and set the alarm to 78 C to know then to take it out of the oven. Thank you!!! I have been researching authentic-ish Panettone recipes for months and yours is the third method I have tried – the first being a total failure, the second passable but not great. I followed every one of your instructions to the letter (ok, except I used Fiori di Sicilia in lieu of orange zest) and it turned out perfectly. I do think that very good, high gluten flour is a key point for making this bread successful. Thank you so much for allowing us to benefit from all of your hard work, trial and error! I’ve now tried this recipe twice and the final dough is batter by the time I incorporate everything. I’m so confused. I added more flour this time, and it came together while still being a wet dough. Wish I knew what I was doing wrong. The taste has been awesome ether way! 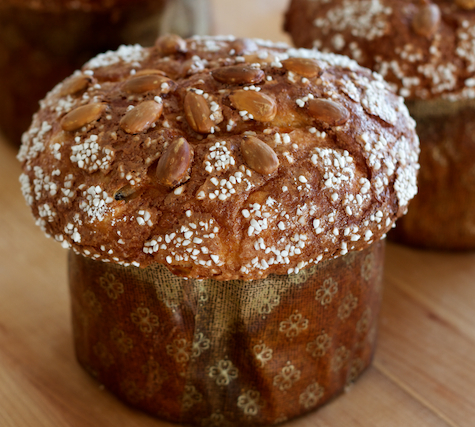 I’m a very experienced sourdough baker, but never tried to make panettone until this year. I was struggling with another recipe (starter was too sluggish), but just before making the first dough I decided to switch to yours and I’m so glad I did! Success!! Thanks so much for sharing your expertise.